Why nuclear deterrence will still work on North Korea. The same logic that has prevented nuclear war for decades will work on Kim Jong-un. 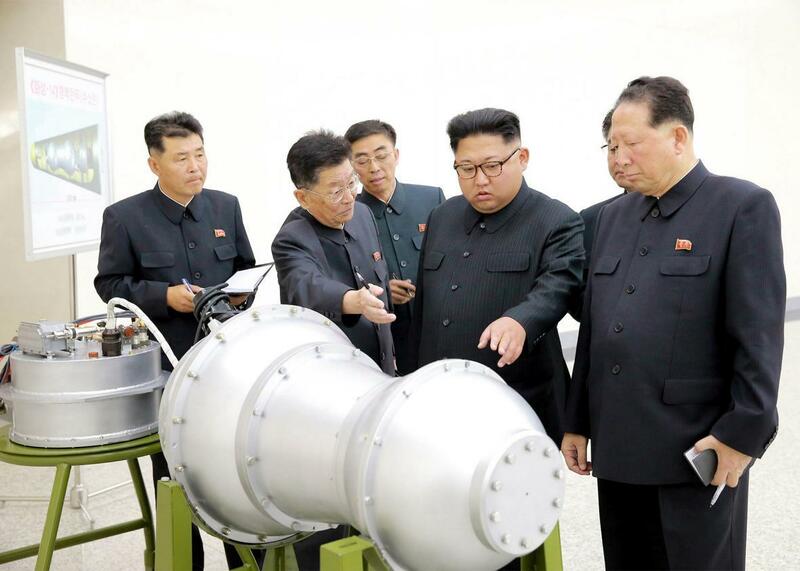 In this undated photo released by North Korea’s Korean Central News Agency, Kim Jong-un inspects the nuclear weapons program in Pyongyang. North Korean leader Kim Jong-un is doing a lot of reckless things these days, but he poses no threat to the United States—or at least no sort of threat that we can’t readily handle. If he deploys a nuclear-tipped missile with the range to strike U.S. territory (as he’ll likely be able to do soon), that will complicate national security policy but in a completely manageable way. It won’t mean that he’s about to attack some American city—or that we need to attack North Korea pre-emptively. In short, it’s time to pipe down about North Korea—not because Kim is benign or powerless (he’s neither), but because the hysteria coming out of Washington these days is overwrought and is making things worse. There are two reasons not to be so nervous about North Korea’s recent tests of missiles and nuclear explosives. First, nuclear deterrence—the theory that Country X won’t fire nukes at Country Y if Country Y has nukes it can fire back—works. In the annals of international relations, there are fewer theories that have a better track record than this one. Second, we have thousands of nuclear weapons—stationed worldwide, on land, at sea, and in the air—and there’s no way Kim could launch an attack on us without facing an annihilating retaliatory blow. In an interview with ABC in August, Lt. Gen. H.R. McMaster, President Donald Trump’s national security adviser, challenged that notion. “The classical deterrence theory,” he said, does not apply “to a regime like the regime in North Korea.” His reasoning: The North Korean regime poses “a continuous threat to its neighbors,” imposes “unspeakable brutality against its own people,” and imprisons or murders “anyone who seems to oppose that regime,” including members of Kim’s own family. Second, as McMaster himself said, Kim has been murderous toward “anyone who seems to oppose that regime.” In other words, whatever else Kim may be, he’s not suicidal; to the contrary, his chief motive, in everything he does, seems to be self-preservation. Classical deterrence theory tends to work very well against that kind of leader. Deterrence is probably the reason Kim is rushing to attain the status of a nuclear power—he is trying to deter us and other countries from attacking him. If North Korea were ruled by the sanest person imaginable, he would very likely be building a nuclear arsenal as fast as he can. The Kim dynasty—dating back to the country’s founder and the current leader’s grandfather, Kim Il-sung—has long understood that its country is a “shrimp among whales” and that the key to survival is to play the whales off one another. Nuclear weapons—combined with ideological controls and fierce rhetoric to match—have long been a valuable tool to that end. “They have used nukes for 20 years to extract all kinds of things,” says Daniel Sneider, lecturer of East Asian studies at Stanford University. “The regime should have collapsed in the ’90s, when it spun into systemic failure and suffered a famine.” Instead, the Kims used their then-nascent nuclear program as a bargaining chip to get food, oil, and other forms of assistance. Now they have some nuclear weapons, and they’re still in the business of extracting. The acquisition of ICBMs—long-range nuclear-armed missiles that can hit the United States—gives them, at least in theory, more leverage still. Since Cold War times, the United States has offered security guarantees to its allies in Europe and Asia. Our ultimate statement of guarantee—known as “extended deterrence”—is that we will respond to an attack on those allies in the same way that we’d respond to an attack on our own territory. This could include firing nuclear weapons against the attacker. In the early days of the NATO alliance, some began to doubt this guarantee after the Soviet Union built its own long-range nuclear weapons. If the Soviets invaded Western Europe, many wondered, would the Americans really launch nukes against Russia, likely resulting in Russia launching nukes against America? As many posed the question at the time: Would an American president sacrifice Boston for Berlin? Similarly, America’s ultimate guarantee of Asian security will be thrown into doubt if North Korea has the capability to hit the United States with nuclear weapons. To update the question: Would an American president sacrifice San Francisco for Seoul? Again, the threat here is not that North Korea will actually attack San Francisco any more than the Soviet Union would have deliberately attacked Boston. Moscow’s motive was (and, under different circumstances, still is) to dissolve NATO—to sever the trans-Atlantic ties between the United States and Europe. Similarly, Pyongyang’s motive seems to be to sever the trans-Pacific ties between the United States and Eastern Asia, especially U.S. ties with South Korea. Throughout the Cold War, U.S. leaders didn’t deal with Moscow’s threat by going to war against the Soviet Union—though there were many right-wingers who argued for a preventive nuclear attack against Moscow’s nascent nuclear arsenal in the early 1950s (and many more who argued to do the same against China, when Mao Zedong, who was seen at the time as more reckless than Joseph Stalin or Nikita Khrushchev, started to build nukes in the mid-1960s). Rather, American leaders responded by building up U.S. military forces (especially conventional military forces) in Europe and in Asia—in short, they responded by shoring up the U.S. deterrent. Deterrence, in a sense, is a confidence game. To be effective, you have to convince the leaders you’re trying to deter that, if they step over the line, you really would do the things you say you’d do. Moscow had to believe Washington would defend Berlin or London as it would defend Boston or New York. Pyongyang has to believe Washington would defend Tokyo or Seoul with the same commitment. Or at least we needed (and need) to make them fear that we might do as we say—enough so that they don’t take any aggressive chances. President Trump is doing a poor job at building up this necessary confidence. Repeatedly he has done what he and others accused President Obama of doing in Syria: He has drawn red lines, then done nothing when they were crossed. He threatened “fire and fury” against Kim Jong-un if North Korea tested another missile—then did nothing when Kim tested another missile, then another after that. After this happens a couple of times, Kim—quite rationally—will get the idea that he can get away with anything. This is not to say that Trump should have bombed Pyongyang after a North Korean missile test. It is to say, however, that Trump sauntered into the ring with no idea of what he was up against, what his (and North Korea’s) stakes were in the contest, and no plan of what to do if things went south. A few times, Trump has laid the problem in China’s lap. After their “chocolate cake” summit at Mar-a-Lago in April, he seemed to think that he’d charmed Chinese President Xi Jinping into doing him the favor. He didn’t realize—and hasn’t yet seemed to learn—that personal relationships count for little in global politics, that serious leaders base their policies on interests. North Korea relies on China for 85 percent of its trade; Xi could shut down Kim’s regime with a finger snap. But, for a variety of reasons, Chinese interests require a stable North Korea, and that means putting up with Kim’s atomic antics (though also, presumably, standing by to contain them if the hermit king of Pyongyang goes too far). What should Trump do, now that it’s clear China won’t do enough? The solutions and slogans that he’s put forth at odd hours in recent days are nonstarters. On Sunday, he tweeted: “The United States is considering, in addition to other options, stopping all trade with any country doing business with North Korea.” This would spark a trade war with China, wreak havoc with global markets, and disrupt or destroy supply chains across U.S. industries. It would also mean stopping trade with India and Saudi Arabia, among other nations with which Trump is cultivating good relations. The first lesson in Diplomacy 101: Never make threats you’re not willing to carry out. The second lesson: Never make threats that the person you’re threatening won’t believe. In another tweet, Trump accused the South Korean government of “appeasement” toward the North (a strangely extreme way of describing an ally that would like to avoid war, if at all possible, with a neighbor with thousands of artillery rockets within firing range of its capital). In a separate tweet, out of the blue, he threatened to revoke the U.S.–South Korean free trade agreement. At just the moment when the Asia-Pacific allies needed assurances of America’s security commitment (preferably its calm commitment), Trump railed against the ally poised on the front lines. Kim must have gasped at the good fortune he’d fallen into. As often happens in these awkward moments, Trump’s aides moved swiftly to repair the damage. On Tuesday, the State Department and the South Korean government issued a “Joint Statement on the Extended Deterrence Strategy and Consultation Group,” pledging that North Korea’s “dangerous and destabilizing pursuit of nuclear-armed ballistic missiles … will not alter the ironclad commitment of the United States … to defend” South Korea. On Wednesday, minutes after Trump ruled out contacts with North Korea, declaring, “Talking is not the answer,” Secretary of Defense James Mattis told reporters, “We’re never out of diplomatic solutions.” Japanese Prime Minister Shinzo Abe, a conservative but sensible politician, has also cultivated good relations with Trump—the two have talked on the phone four times in the past week alone—for the purpose of talking him down from his tirades. So, war, trade war, and helping Pyongyang break up our alliances aren’t good answers to our problem. But there are still useful things he could be doing. First, and above all, don’t make such a fuss—but do take visible steps to shore up extended deterrence. Send more advanced fighter planes, perhaps even dual-use fighter planes (those capable of dropping conventional or nuclear bombs), to bases in the region. Send a second aircraft carrier battle group to the region, too. North Korean spokesmen have hinted they might be amenable to freezing their nuclear program if we canceled joint military exercises with South Korea. This would be a terrible idea, weakening the alliance, which is what North Korea wants to accomplish. But ultimately we are going to have to start talking with Pyongyang again. Sneider says that such talks should include South Korea and other regional powers, but he wouldn’t be opposed to an exploratory bilateral session—just the U.S. and North Korea. “We need to make clear to them what we are ready and able to do if they attack us or our allies,” Sneider said. “And it would be useful to ask them: What do you want?” There might be something we would do in exchange for a North Korean nuclear freeze. It’s worth exploring what that is. Unfortunately, some Japanese and South Koreans don’t trust Trump to hold such a meeting. When they’re not fearing that his erratic behavior and impatience might excite him into war, they fear that his overconfidence as a deal-maker might lead him into making a terrible deal. On Sunday, Trump held a meeting with his top advisers to discuss North Korea, and it is telling who attended: Mattis, McMaster, White House chief of staff John Kelly, and Joseph Dunford, the chairman of the Joint Chiefs of Staff—all of them retired or active-duty generals. Smart as these men might be, they are military men; when they think of options, military options naturally come first to mind. All of them might say that diplomacy must be a factor, but none of them has ever conducted diplomacy. There were no diplomats at that meeting. Secretary of State Rex Tillerson participated by telephone from his home in Texas, according to one official—yet another sign of the former Exxon Mobil chairman’s maddening passivity at his job of top diplomat. If James Baker, Robert Gates, David Petraeus, or any number of other people I could think of were secretary of state, they would have chartered a plane to be in that meeting. Meanwhile, Trump has still not nominated an ambassador to South Korea, an assistant secretary of state for the Bureau of East Asian and Pacific Affairs, an assistant secretary of defense for Asian and Pacific Security Affairs, or an undersecretary of state for the Bureau of Political-Military Affairs. This doesn’t have to be a crisis if we handle it in the way that American diplomats have handled such moments for decades, yet those sorts of diplomats are not within reach. If war erupts from all this, it will come as much from Donald Trump’s stumblings as from Kim Jong-un’s rantings, and that in itself is a tragic statement.